After much anticipation, Super Mario Party for the Nintendo Switch was released on October 5. Super Mario Party’s release celebrates 20 years since Mario Party, the first of the now 11 main instalments to the series, was released in 1998. Nintendo Switch gamers, myself included, have been eagerly awaiting the arrival of more Mario universe adventures. Considering the fact that I’ve already logged 15 hours of gameplay since the game’s release, I think it’s safe to say I’m a huge fan. Upon loading the game, you’re greeted with classic Mario characters. Old favourites like Mario, Luigi, Toad, Princess Peach, and Yoshi are trying to figure out who the true Superstar is, and the “time-honoured tradition” of a party is suggested to determine the winner. Bowser and his clan show up, challenging Mario’s crew, setting up the competition and narrative. With that, you select your character—Koopa Troopa is my go-to pal—and enter the Party Plaza, where you’re able to choose your level of difficulty and style of game. If you’re playing against the computer, I’d recommend the “very hard” difficulty if you want any competition at all. Party Mode, the classic game mode, returns with three boards to immediately choose from, as well as an unlockable fourth. While that isn’t a lot of options, the 80+ minigames keep each battle fresh and exciting. 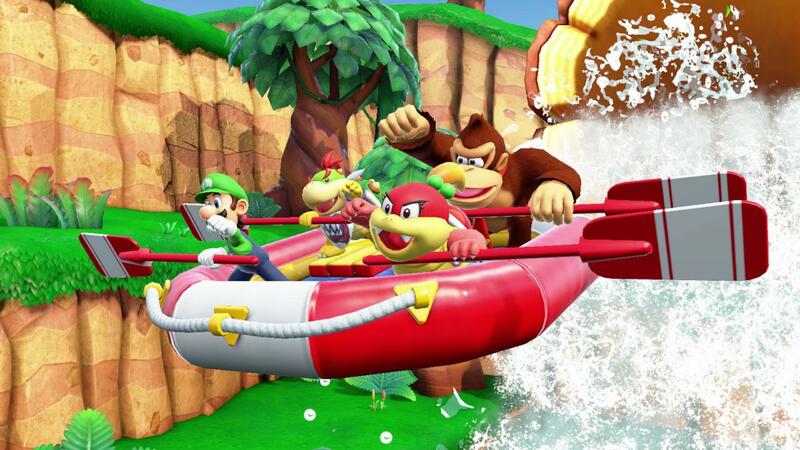 The release of Super Mario Party also saw some new game modes added—like River Survival, in which you work together with your team to race against the clock down a river while playing minigames along the way. There’s also Partner Party, a team edition of Party Mode, where you share dice rolls with your chosen partner and move freely around the board. My personal favourite is the Sound Stage, where you mirror movements shown on screen in time with the beat to earn coins. If you don’t feel like committing to a full game, you can just play a selection of minigames too. While I do enjoy the game, there are a few downsides worth mentioning. Players can only use separated Joy-Con controllers to play the game, so your Pro and Wired Controllers will have to sit Super Mario Party out. The Joy-Con are required because the game relies quite heavily on motion controls. Fortunately, the motion controls really add to the game and aren’t gimmicky or unsatisfying. Another downside is that you can’t play Party Mode online, so you’re limited to either needing four Joy-Con, two Nintendo Switches, or having to play with computers offline. You can play minigames online, but that’s about it. A lot of people were looking forward to the possibility of playing the board game itself online, but it doesn’t look like that will be happening. These downsides can be disappointing, but they don’t totally detract from the game or ruin the experience. They’re minor inconveniences that can be worked around. There’s a lot to do in Super Mario Party, some familiar and plenty new, which keeps you coming back. It’s hard to get bored when there are tons of options for deciding the kind of game experience you want to have. The graphics are clean and the music is upbeat, fun, and easy to get stuck in your head. The game is engaging and a complete, polished package. I think it’s safe to say that Super Mario Party is a great addition to the Nintendo Switch and the Mario universe.